Written and directed by Nick Whitfield, "Skeletons" is like the step brother of Michel Gondry's "Etertanal Sunshine of the Spotless Mind" or Charlie Kaufman and Spike Jonze's "Being John Malkovich." It holds the off-kilter surreal elements infused into a comedy of witty characters who are just as off-kilter as their environment. 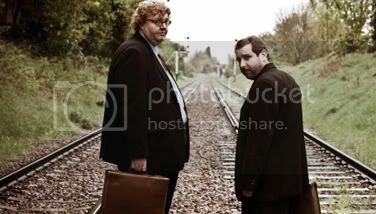 Bennett (Andrew Buckley) and Davis (Ed Gaughan) travel each week wearing suits and carrying briefcases to certain homes to perform their profession, what they call the procedure. They are a mismatched pair, Bennett big and tall while Davis is short and weasel-looking, and each actor delivers a finely humorous performance. There is an immense sense of mystery as this duo visits their first couple leading to them preparing all their equipment, eying a closet mischievously and then, flash, nothing. This profession of theirs is kept veiled for actually a majority of the film as only bits and pieces get revealed along the way. Davis is scolded for taking advantage of their own professional capabilities diving into his own past for nostalgic value. It's called glow chasing and something their boss, a handsomely bizarre man named The Colonel (Jason Isaacs), frowns upon. Bennett and Davis' work gets them tangled up in an assignment with a woman named Jane (Paprika Steen) in search of her missing husband. Steen is wondrously kooky and likable in this role. The assignment leaves them at Jane's house for longer than anticipated unraveling their professional lives completely, and the misadventure is captured with great cinematography. Labeled as extraction practitioners, the men dive into history in a fantastical way that is at the same time grounded in familiar territory. It makes for a unique blend slyly addressing the figurative skeletons that people can keep inside, but it takes a while to wrap up and gets stretched a bit too far by its final end. Interesting. This has got a lot of press coverage over the last few days with it's win at Edinburgh and has certainly got my interest piqued. Glad to see you think it's worthwhile. Yeah, it's definitely worth checking out if it starts getting distributed.